Nathan Pickett stopped 52 of 53 shots when the defending champion New Hampshire Avalanche advanced to the Eastern Hockey League Frozen Finals with a 2-0, 3-1 sweep of the Boston Junior Rangers. The EHL’s four second-round playoff survivors head to Providence to decide the league title. The Philadelphia Little Flyers, East Coast Wizards and Wilkes-Barre/Scranton Knights are the other teams that will take part in a round-robin Thursday through Saturday to set up the championship game. The Little Flyers swept the Philadelphia Revolution, 4-1 and 7-2. Brendahn Brawley made 26 saves in the first win. The Little Flyers got at least one point from 16 different players in the two-game series. The other EHL series went to a third game where they were decided by one goal. East Coast won the first and last games of its series with the Vermont Lumberjacks. Tom Usalis scored with two-tenths of a second left in the second period of the opening 5-4 victory. Vermont scored three times on the power play in a 4-1 win. Steve Rizzuto scored goals three minutes apart to rally the Wizards to a 2-1 win in the deciding game. The Knights also won in the first and third games, using a pair of 3-2 victories to offset a 4-1 win by the New Jersey 87s in Game 2. Thomas Walker is 4-1 with a 2.40 goals against average and .930 save percentage in goal for Wilkes-Barre/Scranton during the playoffs. FRASER CUP: The Alexandria Blizzard knocked West Division regular-season champion Granite City out in the first round of the North American 3 Hockey League’s Fraser Cup playoffs. Dylan Giorgio scored two goals and Ville Hyttinen made 37 saves for the Blizzard during a 4-3 victory in Sunday’s third and deciding game of the series. Higher-seeded teams won 10 of the 12 first-round series. The other lower-seeded winner was the Atlanta Capitals with a two-game sweep of the Louisiana Drillers in the South Division. Cole Thomas Johnson had a hat trick in a 4-0 win Saturday to complete the two-game sweep. Darren Donovan had a hat trick when the Frontier Division champion Helena Bighorns overcame a 4-2 third-period deficit to defeat the Missoula Bruins 6-5 in the deciding game. The Great Falls Americans, Coulee Region Chill, Oswego Stampede and North Iowa Bulls also needed a Game 3 win in order to advance. The division final matchups are: Central, Coulee Region vs. St. Louis Jr. Blues; Coastal, L/A Nordiques vs. Northeast Generals; Frontier, Helena vs. Great Falls; Northeast, Binghamton Junior Senators vs. Oswego; South, Texas Brahmas vs. Atlanta; and West, North Iowa vs. Alexandria. DIVISION CHAMPS: The Aberdeen Wings clinched the North American Hockey League Central Division title Friday with a 4-3 overtime win over the Minot Minotauros. Steven Pokorny scored the deciding goal at 3:01 of overtime. PLAYOFF CLINCHERS: Trevor Kuntar scored two goals Sunday when the defending Eastern Conference Youngstown Phantoms clinched a United States Hockey League playoff berth with a 6-3 victory over the Madison Capitols. The Phantoms joined the conference rival Muskegon Lumberjacks and Chicago Steel and the Western Conference-leading Tri-City Storm as the teams that have clinched Clark Cup Playoff berths. Minot, the Austin Bruins and the Springfield Junior Blues all clinched NAHL playoff spots Friday. Kennan Lund scored with 3:34 left to lift Minot over the Aberdeen Wings, 5-4. Austin’s Hugh Larkin and Springfield’s Ben Schmidling had hat tricks in the clinching wins. The Bismarck Bobcats and Lone Star Brahmas then clinched berths Saturday. Daniel Chadlak scored two goals and assisted two more as Bismarck defeated the Minnesota Wilderness 6-2. Lone Star beat the Corpus Christi Ice Rays 2-1 in a shootout. 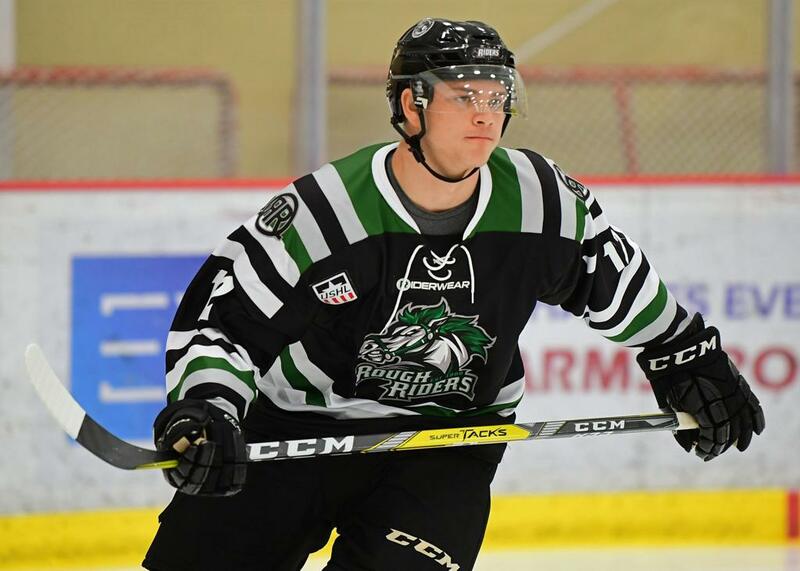 ONE-TIMERS: The Breezy Point North Stars of the NA3HL have named Mike Muller head coach and Cory Bergquist general manager. … Luke Mobley had three goals and three assists Friday when the Fairbanks Ice Dogs defeated the Janesville Jets 8-3 in an NAHL game. Photo courtesy of Edward Jacobs.